Brian & Jenny Hissom purchased Concrete Specialists & Sons, Inc. from Rick & Joan Hissom on April 1st, 2008. 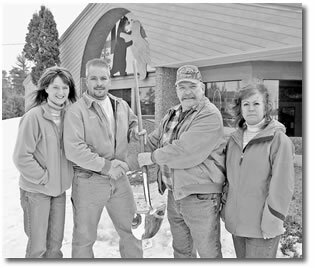 Rick & Joan founded the business in 1975 and with the help of their son, Brian, have provided numerous concrete projects to people all over the Northwoods of Wisconsin as well as the U.P. of Michigan. Our number one objective here at Concrete Specialists is to provide a high quality service and product that leaves our customer satisfied and smiling. Our history of quality control and customer satisfaction has allowed us to be the best in what we do. Concrete Specialists offers a variety of services and products including: Poured concrete foundations, garage slabs, basement floors, sidewalks, patios, driveways, and a whole lot more. Concrete Specialists & Sons, Inc. is well known to many in and out of the area. We have developed the reputation for providing top service and workmanship to everyone we work for. We have a professional team of employees that have been with us for as long as 26 years. All members of our team are extremely knowledgeable about the concrete industry and carry the same philosophy as the business itself, which is providing a quality concrete service and product. We at Concrete Specialists pride ourselves in knowing that you, the consumer, will be highly satisfied with the work we do for you. We are consumers as well, and know the value that is put on customer satisfaction and we promise you will be happy with the work we provide for you.